The Feast of the Holy Trinity is an opportunity to ponder Mary living the great joy of Pentecost. Her relationship with the Father, Son, and Holy Spirit continued to grow after Pentecost – as did that of all the disciples. They had received “power from on high”, and Mary was to care for the young Church, as she had cared for Jesus! The Indwelling of the Trinity had been infused into the soul of Mary from her Immaculate Conception, and Mary continued growing in her fullness of Grace. When the Holy Spirit overshadowed Mary and Jesus became flesh in her womb, what a wonder! How humbly and lovingly her “Yes” continued, and now she continues to “mother” Him in every soul who receives Him! The picture I’ve included in this blog entry is an artist’s conception of Mary. The artist has captured something of the reality of God at work in Mary from the first moment of her conception. As Jesus hung on the Cross, He said to the beloved disciple John, “Behold your Mother”, giving her not only to John but to us all. I believe Jesus wants us to behold in our Mother the work of the Holy Spirit. When we behold our Mother Mary, we see how a simple human person can say, “Yes” to His Word, and truly be a “dwelling place for God”. Our Baptism was the beginning of our supernatural life. Though we were not immaculately conceived as Mary was, we were cleansed of sin and infused with Sanctifying Grace which is a participation in the very life of God the Trinity. God the Holy Spirit continues to sanctify us, as we listen — as Mary did, and do the Truth we hear. God intends us to grow in His life, to be nourished as Mary was by His Word, by the Sacrament of His Body and Blood, by every encounter with Him as He continues to work within us. The Holy Spirit is given to us to bring us into the complete Truth of Jesus, to sanctify us as He sanctified Mary and all the saints who have gone before us. 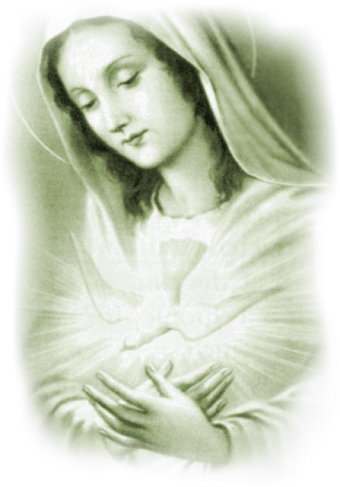 When we behold our Mother we see in her His Truth: “nothing is impossible with God”. As we celebrate Trinity Sunday, let us gratefully renew our Baptism and begin anew — growing, answering God’s “call to be a Dwelling of the Most Holy Trinity” (cf. CCC 260). Each day, may His Light shine more brightly in His Church as He did in Mary. By His Grace let us behold our Mother by faith now, until we behold her in eternity with God, the Holy Trinity, Father, Son and Holy Spirit. Amen. « Adam, where are you? This was a most beautiful comment. Our Lady is Our Heavenly Mother. Thanks so much for your heartfelt words. Yes, Our Lady is our Heavenly Mother, always interceding for us and loving us, more than we can even imagine! May we continue to love and honor her as Jesus did on this earth and continues to do in heaven. Thank you for this post, and the reminders in it of our call into the beatitude of communion with the Holy Trinity. Do we really understand this vocation? Do we understand the holy dignity of our creation in the divine image – and the place that God would make for us, in His Presence? Lord, keep us from the many distractions that would crowd and confuse the simplicity of the one essential truth that must not be lost to us, as we walk through our days on this earth. “One thing is needful,” Jesus told Martha. One precious treasure that is free to all who seek it. Mary, our mother, pray for us. Your question needs to be pondered and answered honestly before God. The most I can say is, “I am grateful to be learning more, by His Grace and through Mary’s intercession.” With you and with all those who long to see His Face, I pray: “Come Holy Spirit, fill the hearts of Your Faithful and kindle in us the Fire of Your Love. Thanks so much for your comment, and for your desire for union with God. The Holy Spirit surely inspires us, as He inspired our Blessed Mother, to grow in Grace throughout our lives. He wants us to experience His Love in deeper and deeper ways as Mary did. This is a beautiful reflection, Deborah. I will reread it many times and hope your words remind me the Holy Trinity wants to indwell in me. Thanks so much for your comment. I too want to be reminded of our call to be “His dwelling place” each day. I made this blog page my homepage so that when I open my computer, I will see the picture of Mary at Prayer, and the Holy Spirit “at work” with Father and Son within her soul. By His Grace I want always to trust He is at work in me too. By God’s Grace, Barbara, let us strive to love as He loves, and remain faithful as Mary did on Calvary. She heard Jesus forgive and she forgave as well. Let us join our hearts with their pierced hearts, always.